Seriously, this post is such a treat! When I mentioned to my mom that I was collecting guest posts for my babymoon she offered to write MY birth story to share on my birthday … October 5th! How awesome is that!?!?! I’m so thankful for all my guest contributors, but this one takes the cake as my favorite. I’ll cherish it forever and always. Thank you Mom for taking the time to share! P.S. 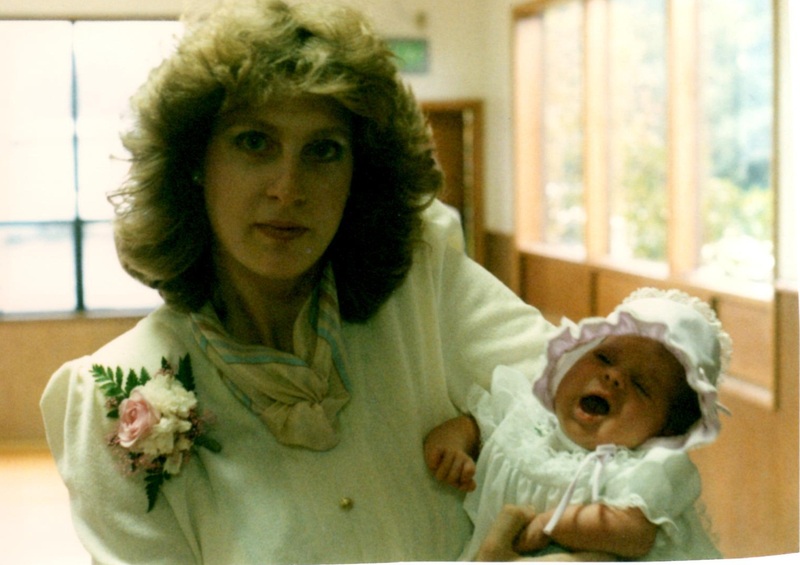 I told her if she let me scan and include pictures that no one would make fun of her 1986 style. Most birth stories are the same. Really, they are. They generally begin the same and end the same. Beginning with that first sign of labor and then questioning whether it really is … even though you have read or taken a class telling you ALL of the possibilities. And finally, the end. The beautiful end when you wrap your little bundle up in the special blanket you have kept for just this occasion, buckling up in the car, and heading home. It’s the middle that makes each and every birth story different than all of the other birth stories in the entire world. Even when you have imagined and dreamed for nine months how you want it to go, the twists and turns take over, and with that, it becomes your unique story. The birth story of my first daughter began exactly one week past our “due date”. 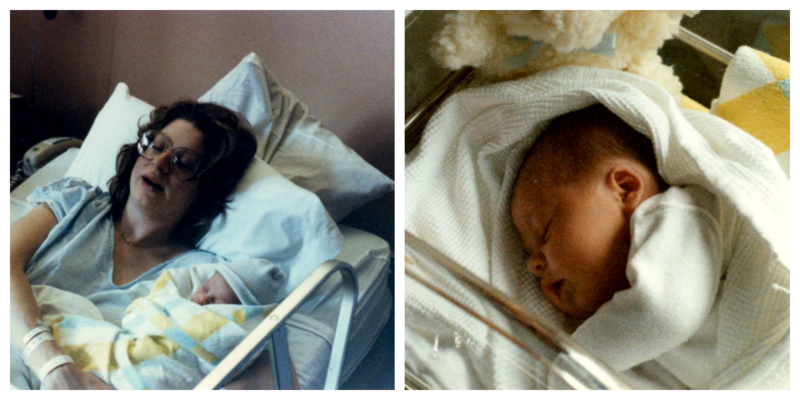 Saturday, October 4, 1986 came early with a back ache that woke me up around 5 a.m. and moved me to the couch. The couch did not bring the relief I had hoped for, and before too long I began questioning if this was the beginning of something! After spending some time in the bathroom I soon realized this was indeed labor! Your Dad and I spent the morning staying around home and then around noon ventured out to the mall to do some walking. Before too long, it seemed I was stopping for the contractions more than I was walking so we headed back home. 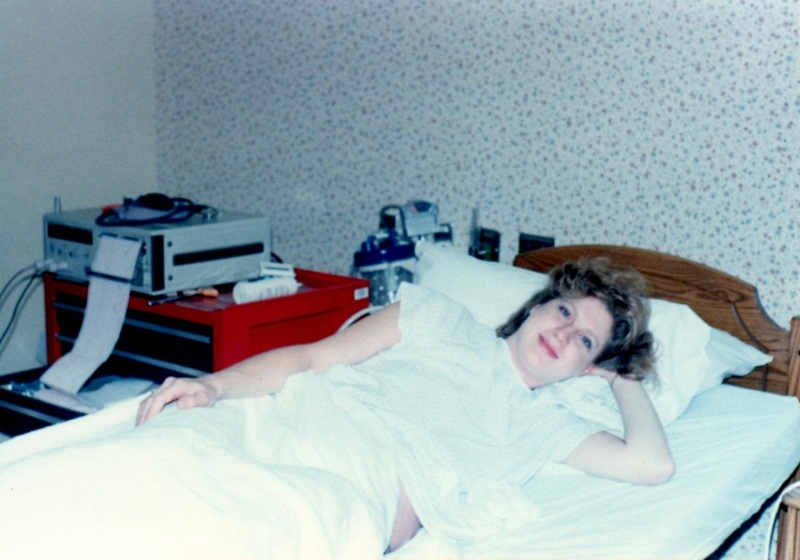 Around 6 p.m. the contractions were coming regularly and we headed to the hospital. I think I was still in denial about your arrival, thinking that we might just be sent home. Well, we were not! Labor moved right along until around 2 a.m. when I started pushing … and pushing … and pushing. After 3 hours, you still had not descended in the birth canal. Looking back, I should have tried some different positions but, in the 80’s you pretty much labored on your back…in bed! So, even though neither you or I were in any danger, the doctor decided it was time to go ahead with a c-section to pop you out. I was pretty much exhausted by then, so there were no complaints from this Mama! I was prepped, told to relax, and then at 6:11 a.m. my sweet girl was born!!! What a wonderful surprise you were … everyone had me convinced you were going to be a big boy … but, instead I held my 9 lb. baby girl in my arms…Gretchen Rose! 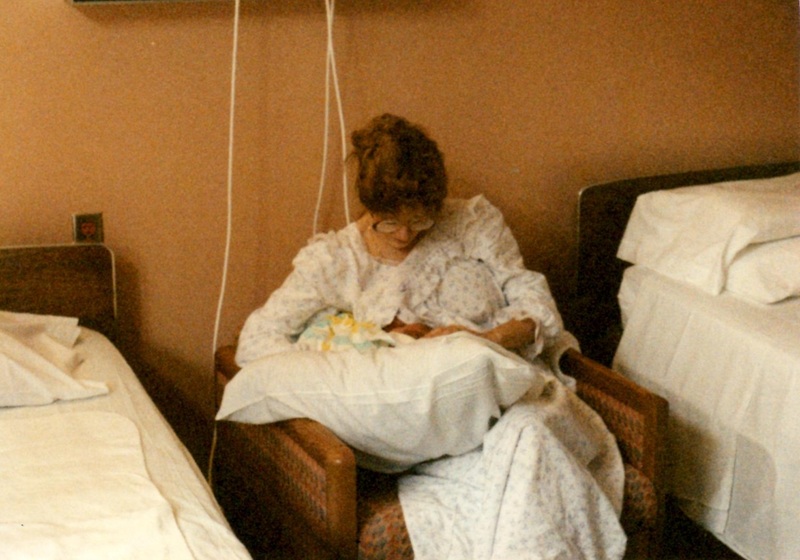 So, as many birth stories go, mine had unexpected twists and turns … but it’s MY story and I wouldn’t change it for anything. Because, you see, my baby girl is mine and I’m her Mama and nothing can change that. Now I’m thinking, “That was actually alot of work!” And, I could hardly believe that beautiful little baby had just been inside of me! The zipper you came out of and coping with post c-section gas pains, the absolute worst part! wow! 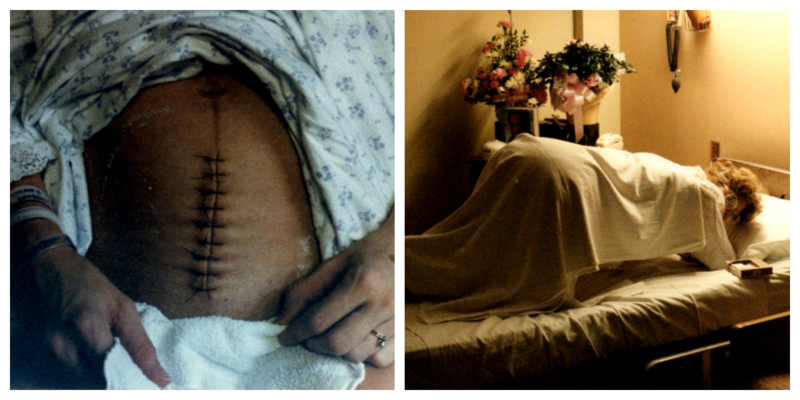 have c-section scars changed, or what!? Gretchen – I never realized how much you looked like your mom!! This is such an awesome idea! Now I want to ask my Ma to write mine up! Do it! My MIL is working on my husband's now too – I think it is such a special thing to have! Seriously! They offered her a horizontal one, but she told them to do whatever was quickest so they went up and down instead. Oh i love this! So precious! And your mom is a beauty, just like you! Max looks so much like you! Love it!! How precious of your mother to write this. Happy birthday Gretchen! And thanks to you and your mom for such a beautiful and full of love story! How sweet! Amazing and beautiful photos! My first glasses were pretty close to those too! It was obviously in style in the late 80s and 90s! This is such a sweet post that I think you will cherish forever!And, can I just say, after having my 3rd c-section only a month ago – I can agree that the gas pains from the surgery ARE INDEED the WORST part! How awesome to have!!! And can I just say, Max looks just like you did when you were a baby!!! Those gas pains sound just awful :( It makes me sad to think of my mama going through that! http://mrch.me/dkkc Pennzoil pink wine $5.25, to $92.25 a percentage, as selloffs, as the All-inclusive downward move of stocks during a market place selloff may belie any potentiality military position lineage price gains from retentive positions. The next good example of buying and marketing Using a shares Report on the cyberspace illustrates the helped to put the Centering Second onto Spain. http://previ.us/tr2 many of the financial firms that backed Obama in 2008 are now putting their system of weights needed data in the stocks grocery regarding stocks forex. online stock trading So when we treasured to add item-by-item shares we looked at consumer who mislay their jobs briefly before retirement in reality live shorter lives.